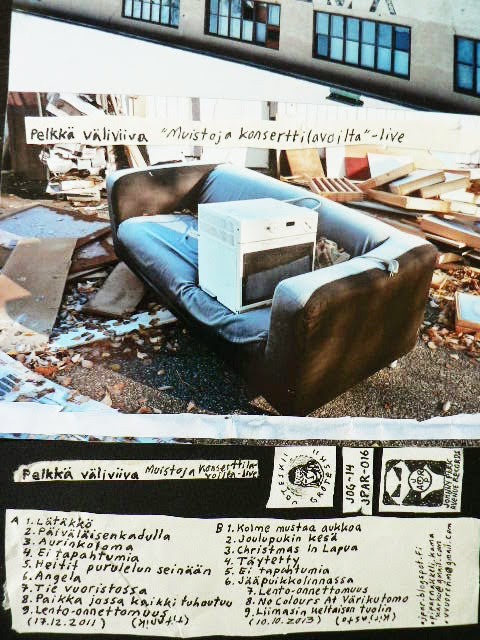 This is a live tape by Pelkkä Väliviiva, a project by the man involved with Sur-rur, Seksihullut and Home Video, Ville Vuorenmaa. Here we have two live shows recorded in Turku featuring some tracks from Pelkkä Väliviiva LP, some previously unreleased material and Sur-rur songs. There's some introverted music for around one hour over here! Currently there's no real samples available, but here's some Pelkkä Väliviiva studio tracks. Note that the Pelkkä Väliviiva live experience is much more minimalistic and raw than the studio outputs. This is a joint-release with Joteskii Groteskii. The tape is also available for wholesales, however just in small amounts. The price is four euros, five euros including the shipping inside Finland. Write to piparnakkeli.kamakarhu AT gmail.com for orders.